Guerilla Games announced today that their new IP, Horizon: Zero Dawn, is on the delay bandwagon. While it's a bummer Sony's new franchise is being delayed for a year, but delays can sometimes make for an incredible experience. And sometimes not. Along with announcing the delay, a $120 collector's edition was revealed giving you a number of in-game content as well as the physical release of the game. 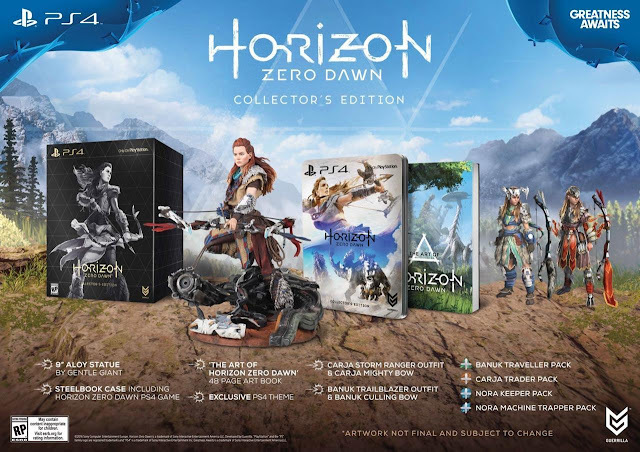 The collector's edition includes a 9" statue of Aloy, the game's protagonist, a steelbook case and a 48-page art book. Also included are several resource packs, weapons and costumes. As of this writing, Amazon has stock available to pre-order the Collector's Edition. Prime members can get the 20% discount bringing the cost to $96 which isn't too shabby if you're into collecting video game merchandise.